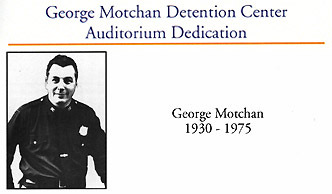 Below are images and texts scanned from NYC DOC's printed program for the dedication of the renovated auditorium in the George Motchan Detention Center as the George Motchan Ceremonial Hall July 6, 2001. That rite was combined with the swear-in of 23 uniformed promotees -- the first such formalities there under its new title. Their names and rank insigna also appear below as do digital photos of the dedication ceremonies. 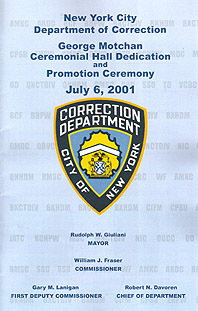 Above is an image of the printed program's heading for the dedication text. To the left is an image of the 16-page program's front cover. 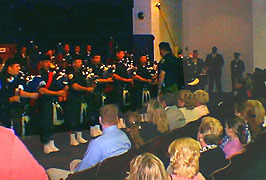 Above the Pipe Band marches to front of hall where Motchans sit. Below the band plays. 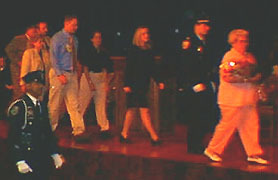 Above the Motchan family is escorted on stage. At left Commissioner Fraser presides at dedication plaque unveiling. 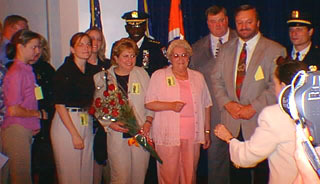 Motchan family photo with Commissioner William J. Fraser and Chief of Dept. 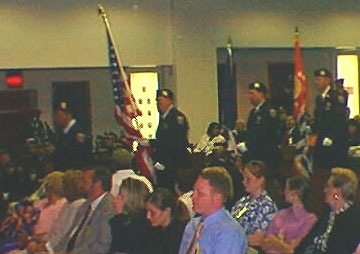 Robert N. Davoren is organized above by Deputy Commissioner Sandra Lewis Smith, far right back to camera. Then the photo is taken, below. 1930-1975 Correction Officer George Motchan, who passed away on September 15, 1975, was the first officer killed in the line of duty in over two and half decades. He was shot attempting to thwart the escape of an inmate at Kings County Hospital. He was 45 years old when he died, a 17-year veteran who was looking forward to retirement in 1978 -- just three years later. At the time of his death, he left his wife, Dolly; his son, George Jr.; his daughter, Kathy, and his only grand daughter, Eileen. Correction Officer George Motchan was highly respected and sorely missed in our department by everyone who had the personal and professional pleasure to work alongside of him. At the time of his death, he had a young family. His daughter was married with a seven month old baby. His son George, Jr., was a 20-year old student, aspiring to become a doctor, an ambition, that made his father very proud. Officer Motchan never lived to see his son become the well established doctor he is today. He is an anesthesiologist who practices in Atlanta Georgia, where he lives with his wife and three daughters. This facility was named for Correction Officer George Motchan on the 12th of June in 1989 and today, we proudly name this auditorium, The George Motchan Ceremonial Hall.